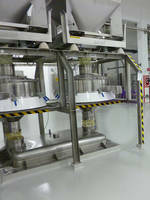 When processing active pharmaceutical ingredients (API's), containment is imperative. Not only does this protect the product from contamination, but it also ensures operators are protected from exposure to the highly hazardous materials. Additional clamps were added to the contact parts in question. When closed, the clamps keep the underpan, mesh screen and lid sealed together, and all parts can be carried jointly to a containment booth for cleaning. As the Russell Compact Sieve® is inherently an enclosed sieve to provide contained sieving during operation, these are the only parts that would be in contact with the API's. Therefore, sealing these components together effectively contains the harmful material, meaning the exterior surfaces are safe to handle, and the sealed unit can be carried by the operator to a containment booth.